If you are looking to reach practice administrators, managers and even physicians throughout North Carolina, then look no further than NCMGMA’s Annual Alliance Sponsorship, which delivers high-impact marketing and quality face-time with healthcare management decision-makers. Alliance provides a selection of core benefits that gain you access and exposure to the Active members of NCMGMA: the practice managers and administrators of North Carolina’s healthcare industry. PLUS: You select the level-specific benefits package that best fits your marketing goals and objectives. An Affiliate membership in NCMGMA for a key contact in your firm. An exhibit booth at the Annual Conference. Recognition and link on the website and e-news site, NCMGMA News. Access to the medical practice decision-makers in North Carolina. Join us in Raleigh as we host our 11th annual Advocacy Days which we promise to be packed full of information you do not want to miss! There is no shortage of issues at hand in North Carolina and NOW is the time to make our voices heard! Make plans to join us in May as we make our long-awaited return to Wilmington, NC. The Annual Conference will be filled with continuing education, networking and healthcare's best product and services on display. Watch for registration opening soon! Watch the NCMGMA website and your email because we're bringing education to your area in the fall of 2019. These single-day events will be filled with networking opportunities and healthcare management education. 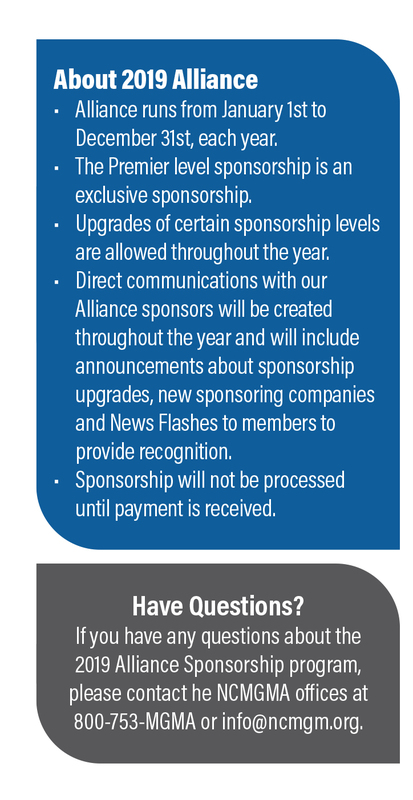 To sign up for Alliance, select the level of sponsorship that best suits your company’s marketing needs and then complete the print form at the link below and return it to the NCMGMA offices.